How about that Patrick Dempsey? He’s so suave and rugged, he doesn’t even shave for a wedding. Here’s Kyle Smith of the New York Post. 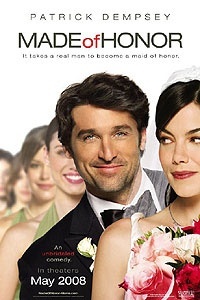 MADE of Honor is something old, it’s something new, it’s something borrowed and it’s something that blows. When Harry and Sally went to see My Best Friend’s Wedding, they could have written a funnier, more original script in the time it takes to eat a box of Milk Duds. This entry was posted in New Releases by James Oliphant. Bookmark the permalink.